I’m an A+. What about you? I’m talking about blood type, of course. Let’s do a quick survey now to see how the types are distributed among my readers! You’re now probably wondering where I’m going with this. Nowhere funky, if that’s what you’re thinking. 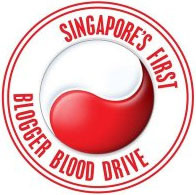 I just wanted to get you all excited about Singapore’s First Blogger Blood Drive, happening on November 29, 2008 at the Bloodbank at HSA! You can get involved by joining the Facebook group for this event. Members will be able to get updates and talk about types and blood and whatever, and make friends, or even organise your own small groups to attend the event together! Also, check out the microsite hosted by Nuffnang, which teases us by releasing info in phases. Three phases have been released. I wonder what’s going in the last empty grey slot. Well, bookmark the site and check back often to find out! So… are you my type? Type B+. 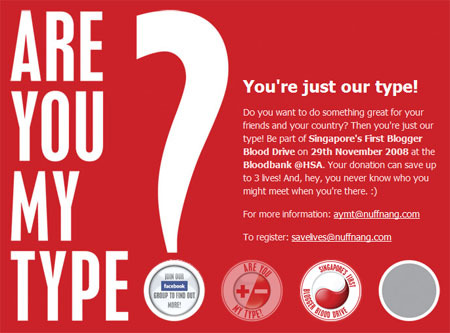 It’s great that you promote the blood donation drive, but sadly like conflict, my blood is not suitable for donation. My blood is radioactive!! I will trade a pint of my blood for Rad X.
I don’t agree with the notion that your blood type determines your personality. Here’s why. Should “O” be a combination of everyone? “O” is the one blood type that is interchangeable, yet it seems to have a direct type of personality. Is it you who is just overly superstitious? And, by the way, stop being so cocky about what you do. You are a hot bimbo nobody who thinks she is some big movie star. If you want to be at the top with the rest of us, start acting like it. If not, be content with being a star blogger (what a hoot. I’d like to meet the moron who can up with this) and a SG XBOX model. Just stop acting like you are a-b list and act like what you truly are. I’m type S. For sheylara fanboi. Or Type Q, for Qiaoyun Fanboi. In no particular order of course! Heeelloooooo children! We’ve got some NEWS in Post-Apocalyptia today! Here’s a public service announcement brought to you by GNR! Please don’t feed the yao-guai… erhm, I mean trolls! Just joking. I’ll give willingly. hey sorry for spamming but when I read Bob’s comment, i feel like calling him a jerk. Sheylara’s just friendly ok? If you ain’t happy then just shut down your computer, go smash your TV, whatever. Keep your mouth zipped. @Nitrixload: Err, i think you just did, hehe:) Well said!